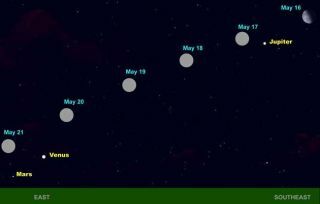 The predawn sky show from May 16 through May 21 as the moon's position changes each morning. By May 21, the moon will be just a thin sliver (it's phase change is not shown here) but it can guide you to the planets. Venus, in fact, is easy to spot because it is brighter than any other star or planet. During May, June and on into early July, watchers of the predawn sky will notice an interesting "double planet" low in the east: brilliant Venus closely accompanied by reddish 1st-magnitude Mars. The scene has already started playing out. On May 1, Mars was positioned 5 degrees to the lower left of Venus, the two rising roughly 90 minutes before the sun. (Your fist on an outstretched arm covers about 10 degrees of sky.) The two planets have been slowly separating ever since, becoming as much as 6.6 degrees apart May 16. Now they'll come back together. Mars will appear to reverse it course relative to Venus and will start approaching it. And for 32 consecutive mornings -- June 2 through July 4 -- they will be within 5 degrees of each other. On the morning of June 21 they will appear closest together with Mars just 2 degrees above and to Venus's left. Venus is currently a dazzling diamond low in the east in the early dawn light. During May and June, Venus will be, on average 160 times brighter than Mars. So while Mars is visible to the naked eye, Venus serves to make the red planet easier to find. On May 2, Venus exhibited its greatest brilliancy as the morning "star" for all of 2009. Most astronomical almanacs prefer to say greatest illuminated extent, because the lit part of Venus' disk covers the greatest square area of sky for this particular morning apparition. That's in spite of the fact that Venus shows only about 25 percent of its lit side and 75 percent of its dark side (Venus goes through phases, much like our moon). But although it was technically at its greatest brilliance on May 2, all through the rest of May Venus will look about the same; its crescent dwindling in size while thickening by month's end to 47 percent of a fully illuminated disk. As spring and summer progress, the ecliptic -- the line that planets traverse in our sky -- makes an increasingly steep angle with the sunrise horizon. Hence Venus becomes even better placed for Northern Hemisphere observers many weeks after its greatest elongation from the sun on June 5. At latitude 40 degrees north, for example, the planet will rise three hours ahead of the sun on July 31, attaining an altitude of 32 degrees at sunrise. But during the last few months of the year, interest will shift from Venus to Mars. By Dec. 1, Venus will have closed to within 12 degrees of the sun and will be rising deep in morning twilight, only 40 minutes before sunrise. On the same date, however, Mars will be a very prominent object of magnitude -0.1 (smaller numbers indicate brighter objects) near the border of the constellation Cancer and Leo.